In God of War, being a mother will end your life, either literally or metaphorically. Much has been written about the game’s depiction of series protagonist Kratos and his journey as a father. The game centers on his strained connection to his son, Atreus. Each major mission is a story beat that takes players through their relationship, from Kratos’ inability to connect with his son at the start of the game, to his son’s anger at him, to eventually the two characters coming together. The mothers in the game have less uplifting acs. One of them, Faye, is dead at the start of the game, though clearly beloved by her son and husband. Her death is the plot device that motivates the action. Kratos and Atreus spend the game trying to bring her ashes to the top of a mountain. The other mother, Freya, is a complicated character, whose familial bonds tie her down. It’s just not great to be a mom in this game. The mothers in God of War are supporting characters. Freya acts as Kratos’s narrative foil. Like Kratos, Freya has regrets and complex feelings about her own son, the angry Baldur. 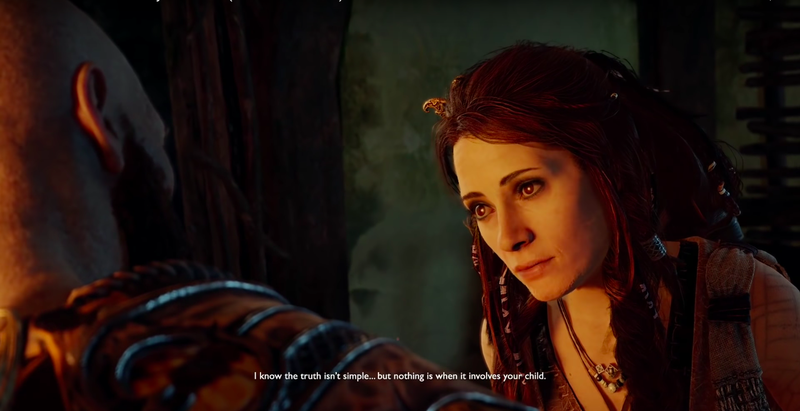 Her relationship with her child represents a hypothetical bad ending for Kratos and Atreus’ relationship. She’s the cautionary tale. Before the events of the game, she foresaw that he would die a pointless death and made him invulnerable to all pain as a result. This inability to feel anything enraged him and made him determined to kill her. Basically, she alienated her son while trying to protect him, which Kratos is also in danger of doing. It’s a moving contrast to Kratos’s own desire to protect his son of the burden of being a god. Kratos’s wife and Atreus’s mother, Faye, is not a foil but an impossible inspiration. She is dead for the entire game, though her presence looms large. Her son and husband’s quest to scatter her ashes is what drives the plot . We learn about her in pieces. Kratos says that she was a great warrior. The dwarven blacksmith Sindri tells him that the axe that Kratos uses was actually made for her. Atreus often remarks that he wishes she was there. Faye is held up as the Platonic ideal of parenting. We hear that she was warm and present where Kratos was cold and absent. This works because players don’t know that much about her as a person. She’s a symbol being carried around by our two leads, regarded as perfect because she doesn’t have the inconvenient messiness of being a living person. Faye is the most mythological thing in this game about myths: a perfect parent. Sure, these women are supporting characters, but even with that they feel held back. While Kratos’s fatherhood allows him to learn and grow as a person, Freya’s motherhood seems to have limited her. Freya becomes consumed by motherhood. When she first showed up, I really liked her. She is smart and capable and sasses Kratos. She is nice to Atreus at a time his father isn’t. She knows a lot about the world, telling us about the elves and how to travel between realms. At the start, she’s a very active character, one who appears to have goals and motivations of her own that run parallel to Kratos’. As time goes on, her potential diminishes. We learn about her history. She married Odin, they had a falling out, and now she’s cursed to be unable to harm him, but also unable to leave. Freya’s fate contrasts with Kratos’ journey. By embracing being a parent, he has new emotional and literal worlds opened up to him. After Freya became a parent, she ends up trapped in her home. Both moms in the game have given up a more active life for domestic pursuits. It could almost be a grim commentary on gendered approaches to parenting, but I’m not so sure. Sacrifice is about selflessness, and what Faye and Freya give up is framed as a sacrifice for their children. Even if what Freya has done makes her miserable, her sacrifice for Baldur is framed as admirable. By the end of the game, Baldur is ready to kill Freya and she’s shockingly willing to let him. She tries to stop Kratos from stopping Baldur. Not being a parent, some of the emotional beats of this game don’t resonate with me. I don’t understand Freya’s continued devotion to Baldur even though he despises her and threatens on her life. In God Of War, though, characters’ lives shift and center around their children and that theme is consistent and coherent throughout the game. I get that. What is frustrating is why Kratos is slowly but surely emotionally freed by being a father, while Freya’s motherhood is a dead end of despair and isolation. When Kratos intervenes and breaks Baldur’s neck, Freya swears revenge on him for killing her son. It felt in character for her, but it also felt like the ultimate flattening of her character. Now whenever I meet her again it will be an interaction that’s about Baldur. All those things I liked about her might be gone—little likelihood of more conversations with magical boars or gentleness with Atreus, just a mother that wants to avenge her child. Her entire selfhood is the last thing she sacrifices for him. Kratos has to change in order to be a better father, and it isn’t easy for him. He’s carrying around a lot of guilt and pain, and he has to let go of his pride enough to acknowledge that he’s hurt his son. Freya has given up her homeland and her marriage, she lives in hiding, unable to free herself from a curse. She has a deep well of emotional pain that we only begin to see once she reunites with Baldur, telling him that she’s willing to die if it will allow him to forgive her. Fatherhood is an exciting new adventure, whereas motherhood is unending self-sacrifice. When I look at the women in my life, I know that’s just not true. Motherhood is full of accomplishments aside from those involving a child. My grandmother got a bachelor’s degree in her 40s. My aunt got a new degree while raising her son as well. My mom has been a tenured professor for the majority of my life. They gave things up, of course. When I was born my mom decided to get a new job so that she could work closer to home and her family, and ended up moving across the country to the only school offering housing on campus. But she still has a full and interesting life. In God Of War, however, moms either give up everything or they die, leaving nothing in their place but a perfect memory.